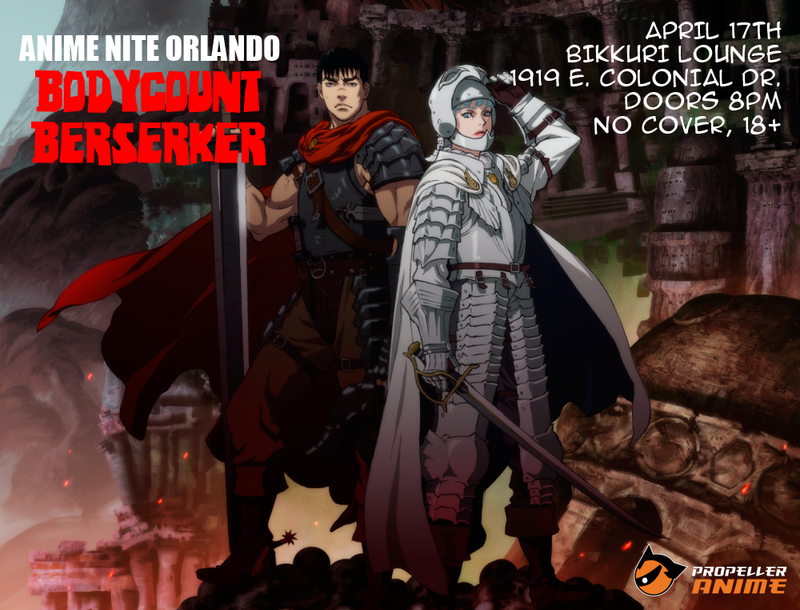 On April 17th, Anime Nite Orlando goes to a very dark place. For it is time for The Eclipse. It is time for Bodycount Berserker! We'll be back at Bikkuri Lounge, located at 1919 E. Colonial Dr. WARNING: THIS EVENT WILL BE FILLED WITH EXPLICIT CONTENT OF ALL KINDS. NOT FOR THE FEINT OF HEART OR WEAK OF STOMACH. There will also be an optional drinking game called "Bodycount Berserker." Every time Gutz kills someone, take a shot, a swig, or whatever it is you want to do. But please drink responsibly. We recommend getting a cab or designated driver. Bikkuri's drink specials are 2-for-1 beers and $3 well drinks. Plus, the finest Japanese cuisine in Orlando will be available to order! Tickets to Ongaku Overdrive II on May 10th will also be available for purchase. Doors 8pm. No Cover. 18+ with I.D. 21+ to drink.